Long before the convenience of modern heating appliances, wood burning fireplaces were our main heat source for heating and cooking. They were the place the family would gather to talk about their day, stay warm and gaze into the mesmerizing flames. Wood burning fireplaces evolved to become more efficient and functional over time, including the revolutionary Rumford Fireplace, designed by Sir Benjamin Thompson, Count Rumford, which was considered the state-of-the-art worldwide. The technology steadily improved with the Rumford Stove, also designed by Count Rumford and Franklin Stove, designed by Ben Franklin and the first to use a baffle system to improve efficiency, From the late 1790’s, these were considered modern conveniences of the time. As more automated central heating became the norm, wood fireplaces were considered more decorative and became less efficient, as most masonry wood fireplaces are today. Almost all modern wood fireplaces are factory built, with masonry giving way to metal fireboxes and chimneys. The majority of these were designed to be strictly decorative with very little regard to efficiency and heat loss. With a growing trend back to heating with wood, fireplace designs have again, evolved and now incorporate features that make them incredibly efficient and clean burning. These high efficiency wood fireplaces are extremely clean burning fireplaces, provide more heat and longer burn times on a single load of wood, and with systems that keep the glass doors clean, so you can still enjoy the mesmerizing ambiance of the flickering flame. Some high efficiency wood burning fireplaces provide a perfect combination of beauty, form and function, incorporating heat distribution options that can duct the heat throughout your home, reducing or even eliminating the need for a conventional furnace. High Efficiency Wood Burning Fireplaces are tested by the Environmental Protection Agency (EPA) in the U.S.A,. EPA Certified Wood Burning Fireplaces must meet strict efficiency and emmisions standards. These standards and EPA ratings are also used in Canada. Wood burning fireplaces of today, come in many styles, from more conventional to contemporary linear units. Outdoor wood burning fireplaces can enhance your outdoor space, providing a warm and cozy patio space, or in a three season room. Prefabricated chimneys mean a wood fireplace installation can be done just about anywhere in your home or outside, with no need for complicated masonry work. When looking to buy a wood fireplace, a visit to one of our fireplace showrooms in Ottawa or Carleton Place can be a great place to start! We have a wide variety of wood fireplace on display, and operational, so you can see how they operate, and learn about the features before you buy. Our experts will help you choose the wood fireplace that best fits the form, function and budget you are looking for. Easy monthly payments are available, and with online pre-approval, you can shop with confidence. Installation of wood fireplaces in Ottawa and surrounding area does require a building permit and inspection from the municipality, but no need to worry. Our experts will provide all that is needed, and ensure that the process is easy and seamless from start to finish. When the installation of your new wood fireplace is complete, we provide a WETT certificate, which certifies that all aspects of the installation of the wood stove meets all codes and regulations. No Worries! Top Hat never does half a job! Once the fireplace is installed, we can do all the framing, drywall and finishing, including installing stone, tiles and a mantle to finish off your fireplace. You dream it, we will bring it to life! Call for a free in-home consultation, or visit one of our showrooms today! The Energy Master Series delivers generous warmth and solid radiant heat. 36,” 42″ or 50″ viewing area – The Exclaim Series offer superior designs and impressive Heat & Glo performance. Heat & Glo See-Through wood-burning fireplaces let you fill two spaces with authentic warmth and ambiance. Enjoy roaring fires even in areas where conventional wood-burning fireplaces are banned. 36″ or 42″ viewing area – An easy-to-operate damper, convenient ash lip and invisible smoke shield make staying comfortable even easier. The 7100 Wood Fireplace is an energy-efficient heating powerhouse. Relax and savor long burn times, stunning flames and Quadra-Fire quality. The Montana is the original outdoor fireplace that started it all. Relax and savor long burn times, stunning flames and Quadra-Fire quality. The Villawood is a wood burning fireplace at home in a variety of outdoor spaces. Our most popular wood burning fireplace in Ottawa. FP16 Wood Fireplace is an exceptional heating solution for small to medium spaces. Heat medium spaces with the reduced footprint of a wall-mount fireplace. 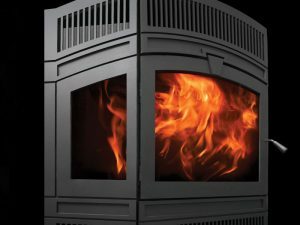 The FP25 offers exceptional wood heat performance with a large contemporary cast iron door and viewing area. The FP30 Wood Fireplace offers the best of traditional wood heat, with a contemporary look. The Renaissance Rumford fireplace lights faster and burns brighter than a traditional masonry fireplace. Renaissance Rumford 1500 wood fireplace burns brighter than a traditional masonry fireplace. The Brentwood™ fireplace combines beauty and efficiency to offer an exceptional wood-burning unit. The Astria Ladera™ high-efficiency wood-burning fireplace is a contemporary marvel.